Alamarra offers 2 commercial size packages and 1 retail size package. The batch date and best used before date are printed on each label along with instructions, a list of ingredients, and Kosher certification. The 50 pound bags have a plastic inner barrier with two outer layers of paper with the top of the bag sewn shut. The bags are fitted inside heavy duty 24″ X 14″ X 6″ cardboard boxes that are completely sealed. 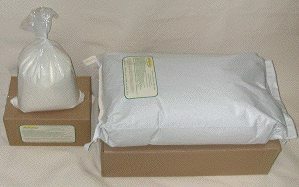 Re-sealable heavy 3 mil polybags containing 10.5 net pounds of mix are fitted inside of heavy duty 12″ X 8″ X 6″ cardboard boxes that are completely sealed. These packages can be shipped individually, two taped together, or in four pack or six pack heavy duty cases. The entire contents of a 10.5 pound bag can be put into a large deep mixing bowl along with about two gallons of water to make a crêpe batter with the ideal viscosity. 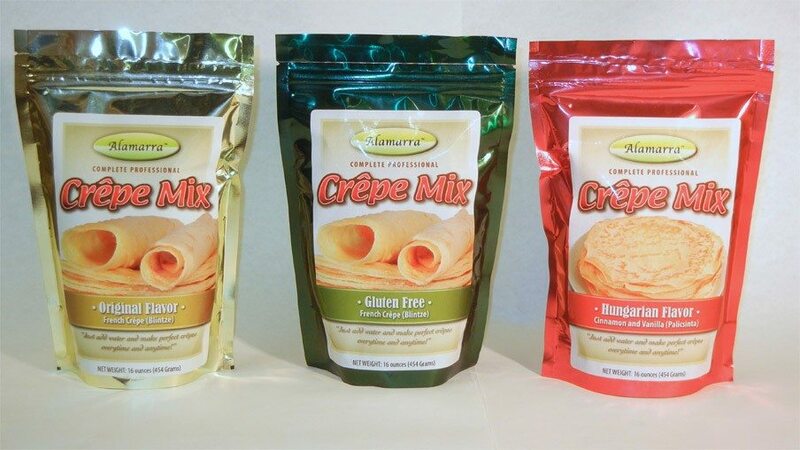 Our 1 and 2 pound retail packages are currently available in Original Style, Gluten Free Original Style, Cinnamon Vanilla, and 2.5 pound Gluten Free Pancake Waffles Mix. They have a tear off heat sealed top with a zip lock for resealing the remaining contents. They are currently available through our website and NOW through Amazon.